At last I can reveal one of my most exciting innovations. 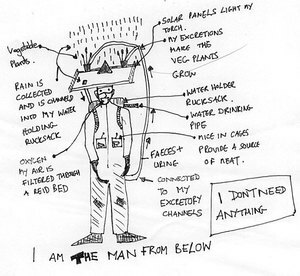 This is a plan for my new self sustaining system for one man that will allow me to travel around the surface without requiring anything from it. The hat multi tasks by catching rainwater that goes into my water holding rucksack, where it is purified, capturing solar energy from the sun to light my torch and growing vegetables for me to eat on my travels. It also has a refelective surface so that it pushes the global warmup dangers away from me and back to where they came from. The vegetables utilise my own urine and faeces for their fertiliser and some of the rainwater for their water. I have a couple of cages of mice attached to my boiler suit - these mice will be fed on some of the hat top plants and provide me with the essentail meat I will need for travelling around the dangerous surface and making it better, whilst eductating people out there of my designs for our safe, sustainable and 'like Dickens times' future. I am now the first self sustaining human system in the entire world, I need nothing and nobody when I am on the surface. I can't be effected by any of the unknown dangers and then I can get back to my underground community and be safe again! I feel like I really need to get these ideas out there and this is why I have decided to do some promotional work on the surface during August - I will publish a full list of locations soon - but I am inviting you all to come and join me as I show you our future above and below the surface. Also I will have finally completed my next episode of Man From Below TV and I will get it out there for you to see and learn from. take care and remember it's time to go below. I've been reading on the internet and I've discovered a new tool that is going to aid us in making the very best use of the Thames Gateway. The tool is called 'Permaculture' - this is a design system for living that as of today I am adopting and updating for my own and your own needs. Using permaculture we can make the very best use of our new surface above us so that we use the smallest area possible to survive - allowing plenty of room for the marshland and the fields. Permaculture designs ways of planting that follow nature - planting a whole range of plants that interact with one another and recycling all possible waste back into the planted area. These areas then become each of our own food stores that we can live off without the need for shopping and dirty packaging - no need for all that stuff that's in the landfill sites. But permaculture is not just about gardening - we can design our whole lives by it so that everything we do makes things better. 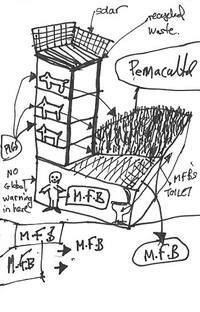 I will design my first permaculture garden on the surface of my underground shelter. Please refer to the image to see my initial concept - you will see how I have connected the toilet to the garden - my waste becomes it's fertiliser. You will see also how I've been thinking outside of the box and created a 'pig tower' - this tower - built from waste materials from the landfill, will contain pigs on a number of floors - I'm using the tower block concept to save the green space - I'm gonna eat the pigs so they can live on the surface - global warming won't matter to em. I will put enough pigs in here to sustain me with meat for a year. Again all of their slurry will go straight back into the permaculture and let it grow very well. From this day forward I want you to all start thinking about permaculture as our future and begin to design your own garden layout and pig towers - maybe try a fish tower or even a cow tower - it's up to you. This is the start of a new safer and realer future where the green returns and this time we don't mess it up. Please send me your designs for your permaculture system as I'm always interested.